These two galaxies have been slowly merging for eons, and the process is now almost over — indeed, the galaxies now share a single name, NGC 2623. This could be an early preview of our own galaxy's fate. The two galaxies that now form the newly born NGC 2623 were likely both once spiral galaxies, roughly the same mass as the Milky Way. Our own galaxy is due to collide and merge with the Andromeda Galaxy in approximately 3.75 billion years. Andromeda is also a spiral galaxy roughly 1.25 times the size of the Milky Way, meaning this collision may well resemble the eventual merger between the Milky Way and its neighbor. This is probably going to be the easiest way to get a sense of what the merger of our galaxy with its neighbor will look like. After all, even if you can negotiate the whole "surviving for 3.75 billion years" thing, you won't be able to stay on Earth if you want to see the show — beyond the fact that watching a galactic merger from inside one of the affected galaxies doesn't provide an especially good view, there's the minor detail that Earth will likely become too hot to support life within the next 1.5 billion years as the Sun slowly increases its luminosity. So yeah, probably best to just take a gander at this one and imagine. 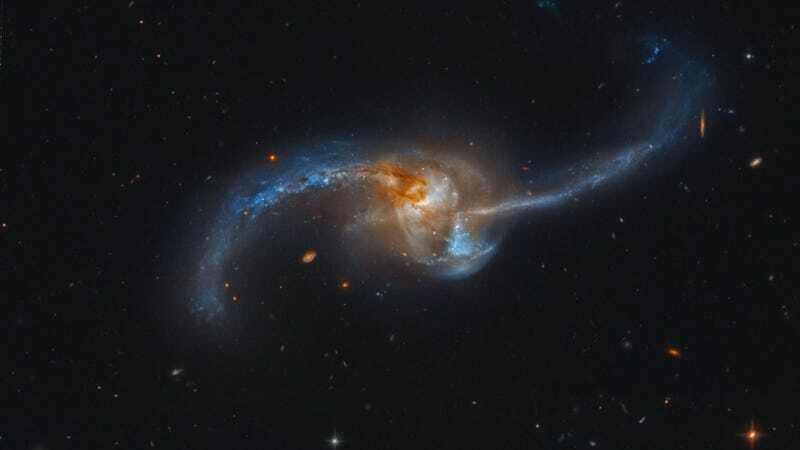 The violent encounter between two galaxies that may have been similar to the Milky Way has produced widespread star formation near a luminous core and along eye-catching tidal tails. Filled with dust, gas, and young blue star clusters, the opposing tidal tails extend well over 50,000 light-years from the merged nucleus. Likely triggered by the merger, accretion by a supermassive black hole drives activity within the nuclear region. The star formation and its active galactic nucleus make NGC 2623 bright across the spectrum. This sharp cosmic snapshot of NGC 2623 (aka Arp 243) is based on Hubble Legacy Archive image data that also reveals even more distant background galaxies scattered through the field of view. You can also check out a narrated video all about the merger over at the Hubble Site. Image credit: Hubble Legacy Archive, ESA, NASA; Processing - Martin Pugh.